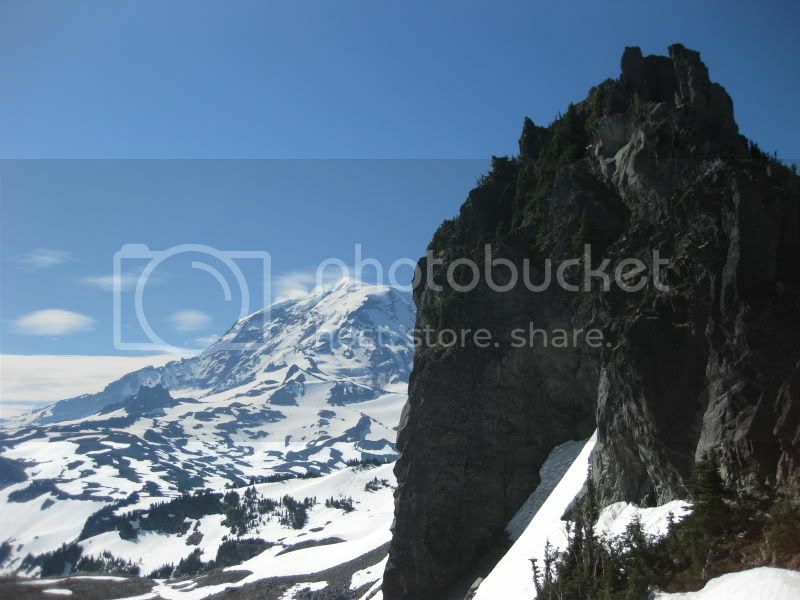 July 14, 2010, Mt Rainier, Russell to 10300: Wow! 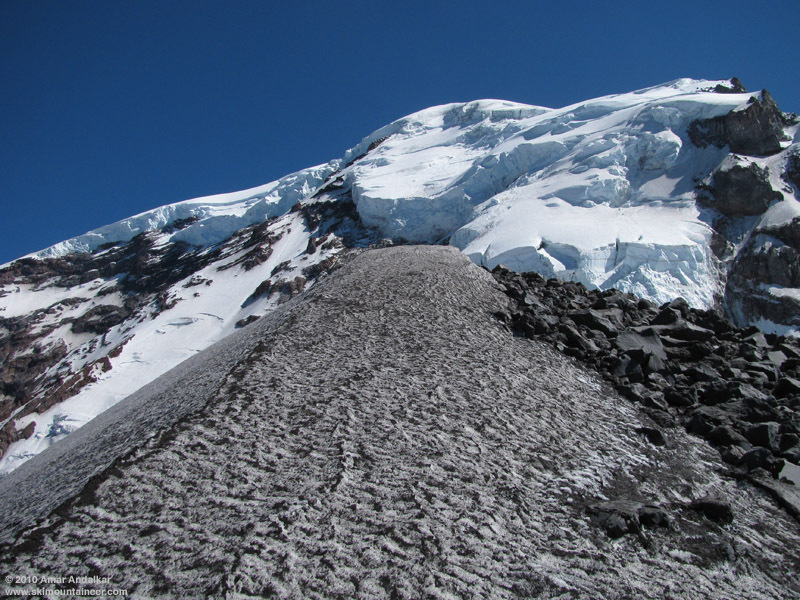 Figured the Russell Glacier would be in good shape based on recent reports, including a photo which showed that the steep slope at the head of the glacier above 9600 ft was white with snow. Usually most years, this headwall is nearly black with dirt, heavily suncupped, and strewn with fallen rock by the time the Mowich Lake road opens in July. The headwall leads to a mini-summit located at 10300 ft on lower Ptarmigan Ridge, and I hoped that would be a worthwhile goal. 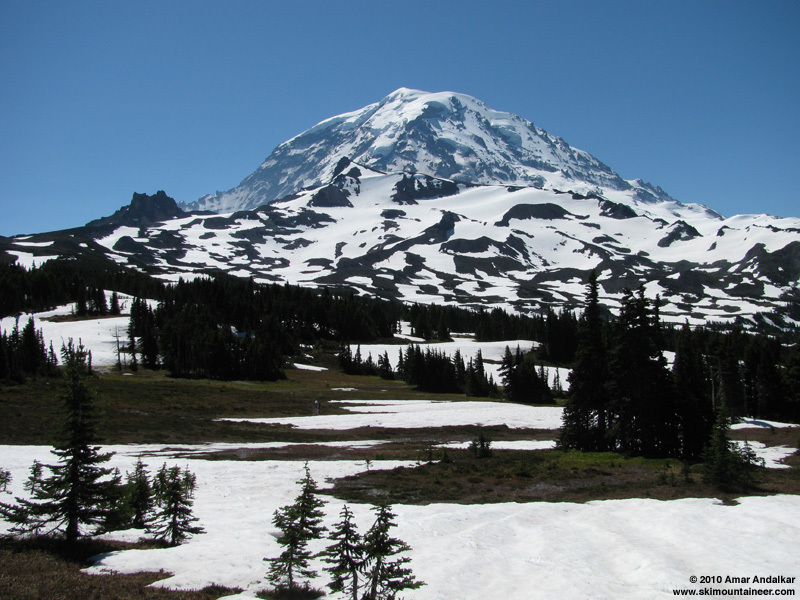 It turned out to be one of the most spectacular spots I've ever been to on Mount Rainier! Jaw-dropping view of Liberty Cap Glacier and Ptarmigan Ice Cliff, from the 10300 ft summit atop lower Ptarmigan Ridge. Left the car at 8:30am and headed in via Knapsack Pass, but this turned out to be a very bad decision. Met another solo skier, Jeff, and we joined up informally for the rest of the day. 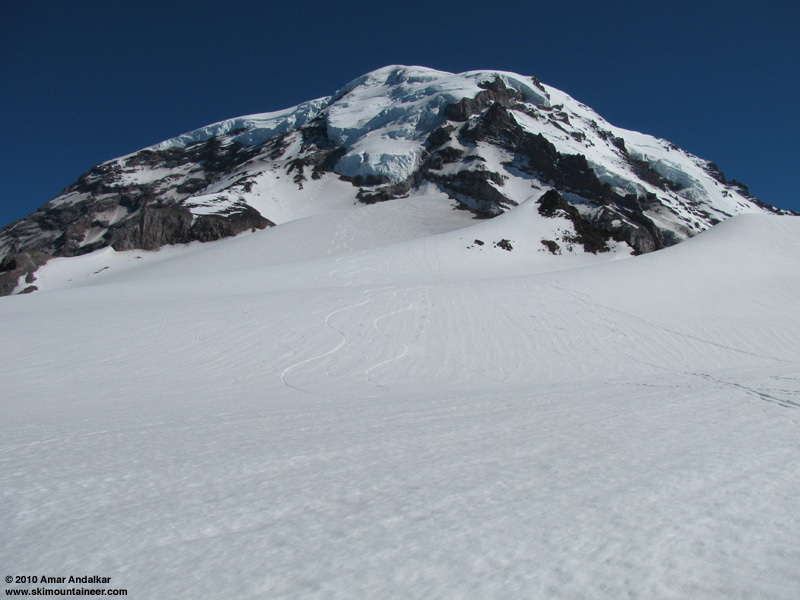 There's no skinnable snow before the Pass, plus nothing continuous after the Pass for another half-mile, and skinning that first continuous-looking snowfield simply led to another long bare south face on the east ridge of Mount Pleasant, which we booted down. Lots of "cross-country" skinning from the base of the ridge across Spray Park to finally reach continuous snow around 6200 ft at 11:30am (!). Knapsack cost us at least an hour or more, versus taking the regular Spray Park trail in. 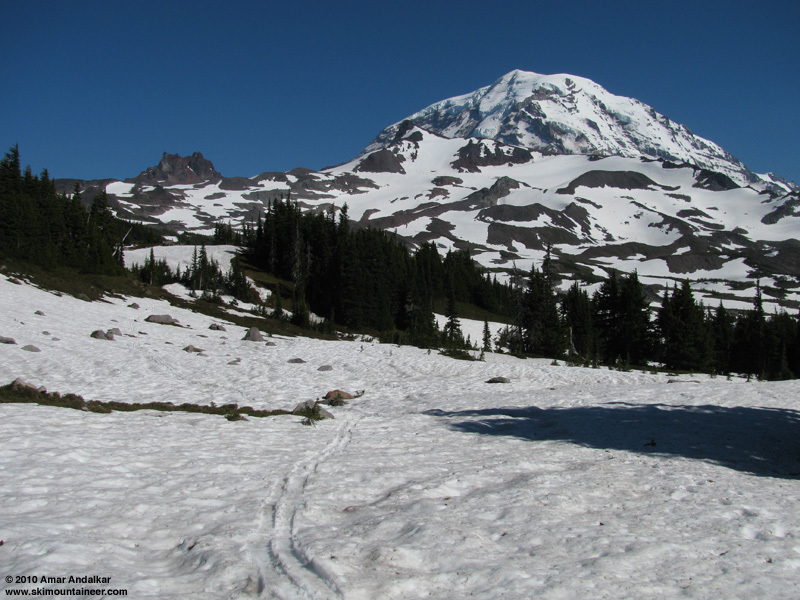 Patchy snow on the way to Spray Park from Knapsack Pass. Skinned up the central lobe of the Flett "Glacier" past the still-frozen moraine-dammed Lake 6583, then easily connected on snow across the north ridge of Observation Rock near 7500 ft to reach the large eastern portion of the Flett (this crossing should be continuous snow for a while longer). The Flett-Russell crossing at 7800 ft is getting very thin however, it won't be continuous in a few more days. 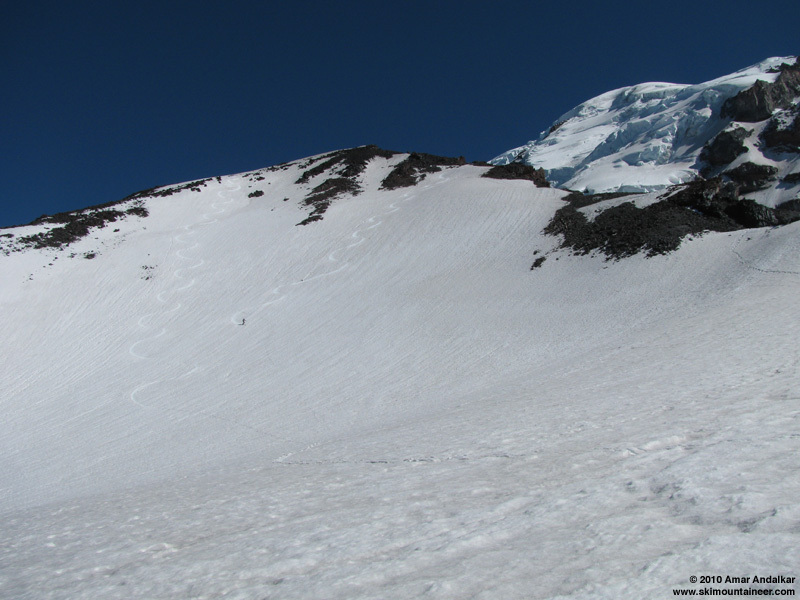 The Russell Glacier remains in excellent shape, covered in deep snow, mostly quite smooth and with no visible crevasses yet. The heat of the 14500 ft freezing level, combined with the annoyingly snowless approach and near-calm conditions on the Russell, had drained my 2.5 liter reservoir by 9500 ft, so I stopped to melt another 1.5 L of snow on the Jetboil. I would need all of it. Skinning up the Russell Glacier near 8500 ft.
We skinned up to about 9800 ft where the headwall steepens, then switched to booting on snow to reach the climbers' path along the bare crest of Ptarmigan Ridge. Jeff stopped near 10000 ft, but I continued up the ridge to a flat spot at 10200 ft, where I switched back to skins for the final bit to the 10300 ft summit atop the Ridge by 3:45pm. Really dirty snow on this final part, there's a large area of foot-deep black sand along the ridge which blows onto the snow, but that's a small price to pay for the absolutely sick view and tremendous airiness. Very dirty snow on the last few feet to the 10300 ft summit. 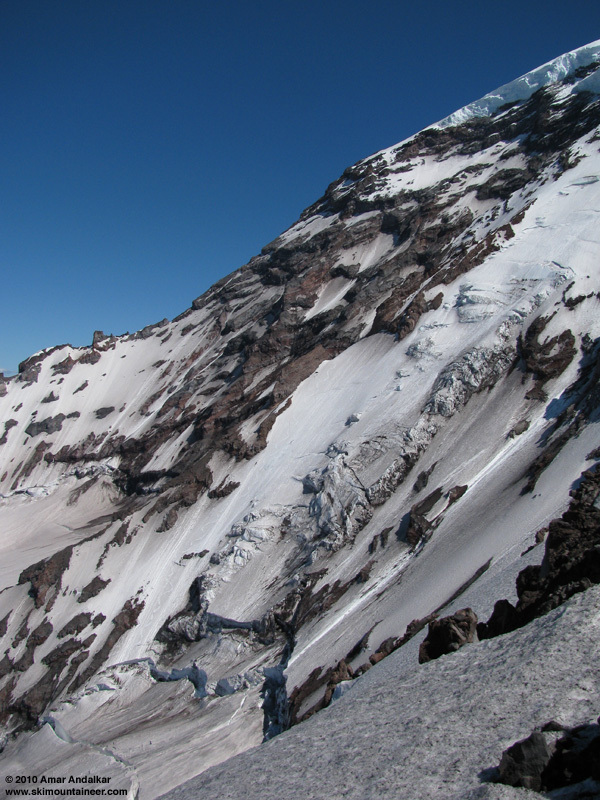 Looking back along the skin track from the summit, with Carbon Glacier far below at right. 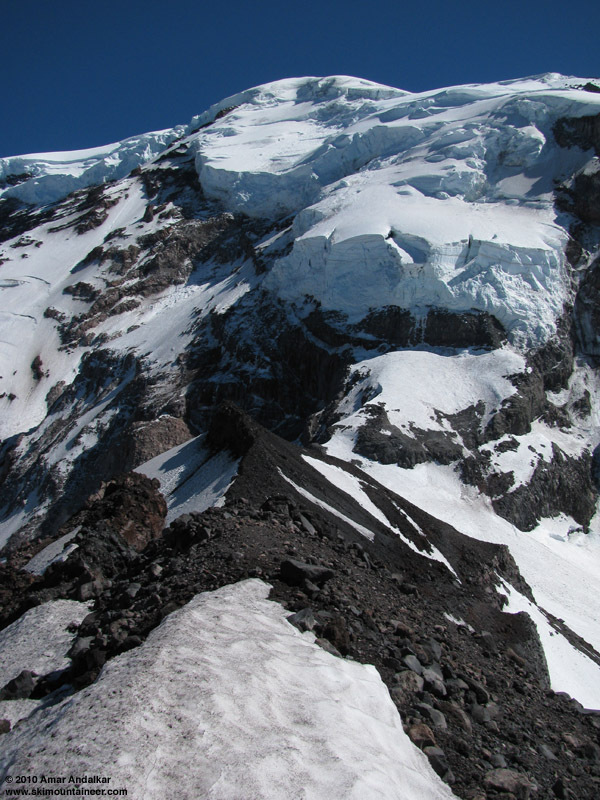 A narrow summit that you can skin up, with a steep 2000 ft drop to the Carbon Glacier on the east side and looking south at huge ice cliffs (Ptarmigan Ice Cliff), plus a view straight across to recent ski tracks on Liberty Ridge. Just an amazing place, hard to capture the feeling in mere words or photos. Switched over very carefully atop the summit, it's not too narrow, but the exposure of the eastern slope which rolls over and drops 2000 ft to the Carbon is intense. Skied back down the ridge at 4pm, initially straightlining slowly on the gritty black snow, then grinding a few turns into the ash as the slope widens and steepens. The snow soon brightened and turned to nice corn, not oversoftened at all despite the late hour, and the near-40-degree slope of the Russell headwall was a total blast. Jeff joined me from his resting spot atop the eastern side of the headwall, and we skied the rest of the glacier in a few long joyous bursts, grinning broadly at the magnificence of both the snow and the setting. Jeff carving up the Russell headwall, with my track at left. 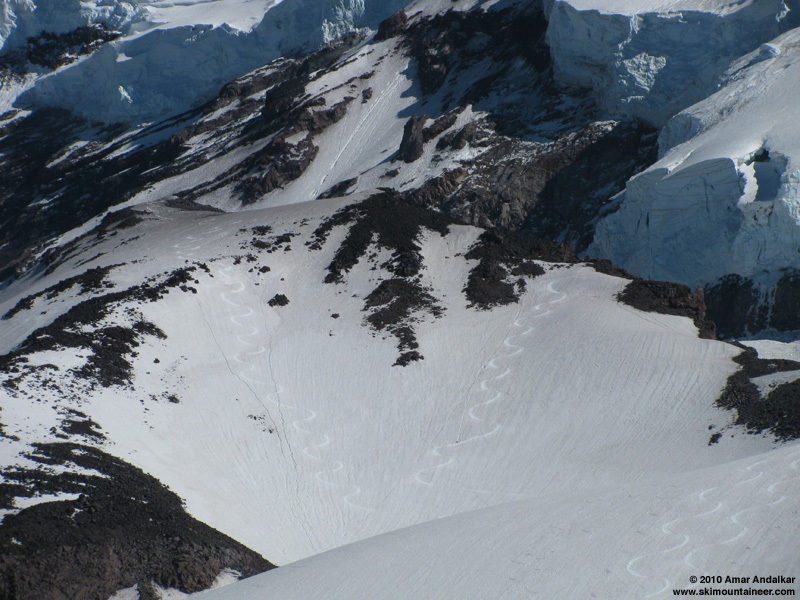 Ski tracks on the smooth corn of the Russell Glacier. Zoomed version of previous photo, showing my track down from the 10300 ft summit. Traversed back across to the Flett and then over to its central lobe below Flett Headwall, where the snow became a bit stickier, but not too bad all, still no major suncups and runnels above about 6500 ft. Below the lake, we considered our options for continuing the ski descent as far as possible. I figured that heading down an obvious stream gully, which I knew followed the path of a formerly maintained trail through Spray Park, would be the best bet, and this turned out just right. Skied all the way out on nearly continuous snow with minimal bare sections (each of which contained the obvious well-constructed tread of the unofficial trail), reaching the Spray Park Trail near 5800 ft just after 5pm. Continued skiing down along and beside the trail to 5700 ft, where the continuous snow rather suddenly ended. Skiing out to the Spray Park Trail on nearly-continuous snow. We were grateful to have a nice well-constructed trail for the exit, despite the numerous exhausting ups-and-downs along its poorly designed route which add at least 500 extra ft of gain to the hike out, and the 3 miles back to Mowich Lake went by quickly in just over an hour. Totals for the day were about 6500 ft of gain for 4600 vert of ski descent, most of it on excellent summer-like corn snow, starting from a jaw-dropping viewpoint amid a chaos of glaciers and cliffs, all the way down to peaceful meadows with flowers blooming through the vanishing snow patches. Easily my best ski day yet in numerous trips to the magnificent Flett-Russell area since 1996. SYNOPSIS...WEAK HIGH PRESSURE ALOFT WILL PREVAIL OVER THE REGION THROUGH THURSDAY. EXPECT THE SOUTHERN END OF A WEAK...LOW PRESSURE SYSTEM TO MOVE ACROSS THE AREA ON FRIDAY. THE MAIN IMPACT THIS SYSTEM WILL HAVE ON OUR WEATHER WILL BE INCREASED CLOUDS AND COOLER TEMPERATURES. TODAY...SUNNY. FREEZING LEVEL 13000 FEET...RISING TO 14500 FEET. TONIGHT THROUGH THURSDAY NIGHT...MOSTLY CLEAR. FREEZING LEVEL NEAR 15000 FEET. FRIDAY...PARTLY SUNNY. FREEZING LEVEL LOWERING TO 13500 FEET. FRIDAY NIGHT AND SATURDAY...MOSTLY CLEAR. FREEZING LEVEL 13500 FEET. SATURDAY NIGHT...MOSTLY CLEAR. FREEZING LEVEL 14000 FEET. SUNDAY NIGHT...PARTLY CLOUDY. FREEZING LEVEL 12500 FEET. MONDAY...PARTLY SUNNY. FREEZING LEVEL 11000 FEET. MONDAY NIGHT AND TUESDAY...PARTLY CLOUDY. FREEZING LEVEL 10500 FEET. 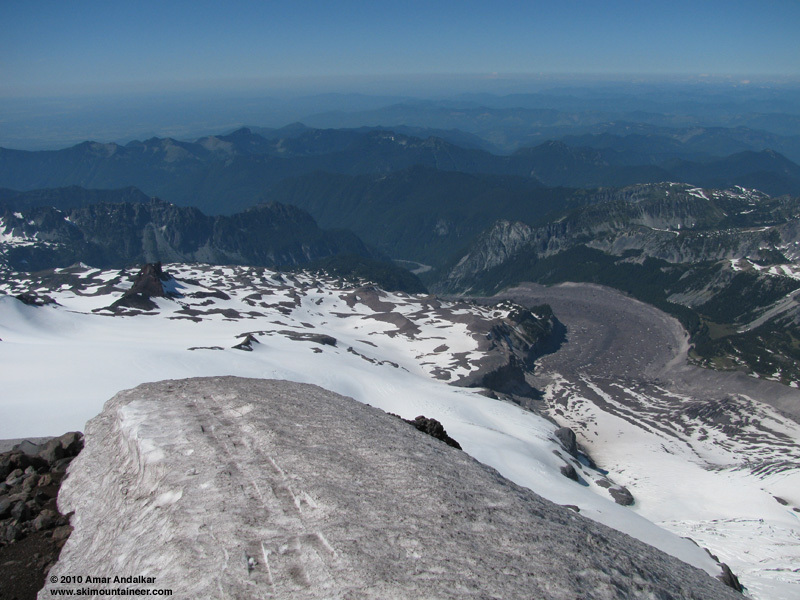 Re: July 14, 2010, Mt Rainier, Russell to 10300: Wow! Nice tour, Amar. Follows the pattern of this spring/summer: weak/no snow low, lots up high. Did you boot up Mt. Pleasant? If so Keith and I folowed your line, sort of. We noticed how fat the Russell was up high. Last summer the Russell was a rock-toss from Jeff's line to the ridge. Spray Park Trail is definitely the way in for 2010. Didn't know you ever went that LOW. We were up near there one year and watched a boxcar size ice break off and crash down onto the carbon.What a commotion! Thanks for the report Amar. I almost always take the std. trail and stash some beers and canned pineapple in the last stream before the switchbacks. It makes that 500' gain on return more palatable. You mentioned jet boil. What we have done is one person pack a water filter and refill at waterfall pools on flett. Cool. Thanks for the report and great pics. I love the larger version of those ski tracks on Liberty ridge! Thanks for the report and inspiration - there is more to Russell than I thought. We were grateful to have a nice well-constructed trail for the exit, despite the numerous exhausting ups-and-downs along its poorly designed route which add at least 500 extra ft of gain to the hike out, and the 3 miles back to Mowich Lake went by quickly in just over an hour. I always tell Brenda it's only an additional 100'. I took the summer trail. Well into Spray Park, I ditched hiking boots and skinned continuously to the base of the Flett headwall, then crossed the north ridge of Observation Rock, then doubled back to my high point on a shoulder of Observation. I�m guessing it was the two of you I was following up the Flett. Left the car around 9:30; headed down about 1:30 and back to the car at 4:00. 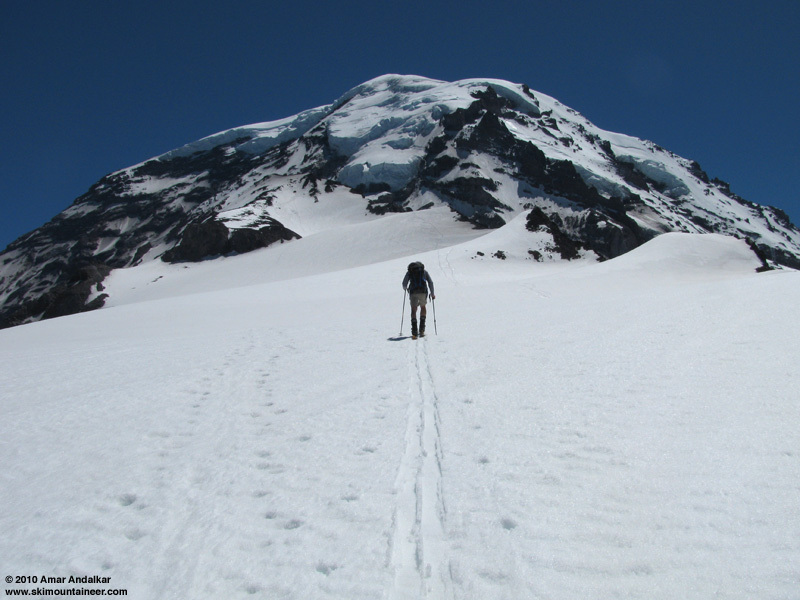 This trip includes the best of winter and summer fun (except for the heavy pack), including a scenic hike on a well-maintained trail, easy skinning and really good skiing. I skied your exact line from it's highpoint on Saturday, even committing the same folly of heading to Knapsack pass first. I was able to ski down the back side after dropping ~50 ft and I believe skin straight across the melted out section of Spray Park in your picture, so it is definitely going quick on the flats of Spray park. The upper slope on the Russell was definitely the highlight. Great TR. Love the descriptive commentary. For a moment their I felt like a kid again; manifesting architectural-marvels with Legos and playing with GI-Joes, all the while sputtering out verbal explosion sounds... Might have to rethink my weekend... Rad. It was just as awesome today. Tons of great people around, and hero corn all the way to bottom of Flett headwall.